Vortex makes many popular sporting optics, and it shouldn’t be a surprise that their Razor HD 10×42 binoculars are a favorite for those with a budget around $1k. They are high-quality, lightweight binoculars with a crisp, bright image, and come with a VIP unconditional lifetime warranty. Read on to learn the specifics of these binoculars and prepare to be impressed! Made in Japan, these binoculars have a true open-hinge design. This means that unlike open-hinge binoculars that have two connecting bridges that are very thin, the Vortex Razor HD 10×42 binoculars have just one thicker connecting bridge. However, this bridge connector is still much thinner than the bridge on standard roof prism binoculars, leaving more of the barrels exposed. This gives the extra security needed for one-handed holding. The magnesium chassis on these binoculars is much more durable and solid than the usual aluminum chassis, while the thin, dark green rubber covering will protect your binoculars from most minor impacts. The magnesium and rubber are both non-reflective, making them great for observing timid wildlife. The rubber has a sandpaper grit that is not as tactile as some binoculars’ covering, but is still non-slip, and the magnesium has a rough texture that is also non-slip. The parts of the binoculars not covered by the rubber are the bridge, a small inset on the inside of each barrel, and about one-third of the end of the barrels. While this helps lessen the load, if something metallic (such as a ring or keys) strikes the binoculars, it will make a ringing noise that may scare off some animals. Under each barrel is a thumb indent, which encourages you to hold the binoculars in the proper position. If held in this fashion, the binoculars are well-balanced, which makes for a stiller, clearer image that is less strenuous on the eyes. The optical lens, which is a large 42 millimeters in diameter, is set about eight millimeters deep into the barrels. This helps prevent damage to the objective lenses when the lens caps are removed. At 1.55 pounds, these binoculars are very lightweight, but remain solidly built and durable thanks to the magnesium chassis mentioned earlier. These binoculars are compatible with a tripod adaptor with one-fourth inch threading, allowing use on a tripod or car window mount. However, the adaptor is sold separately. Made of metal and rubber, the eyecups are durable but comfortable. Forty millimeters in diameter, the eyecup is quite large, making fitting it on your eye sockets quite comfortable. In addition, the helicode mechanism of the eye cup is simple and very smooth to operate. The eye relief is a big plus for eye glass wearers at 17.5 millimeters. The focus Wheel diameter is thirteen millimeters, about standard for full-size binoculars. It has good resistance without being too loose and causing over-rotation. There is a decent reach distance, allowing you to turn the focus wheel while holding the binoculars in the standard position. (Based on an average man’s hand) The wheel is nicely grooved, protrudes from the binoculars a good distance, and is fairly large. This makes turning it easy even with thick gloves, such as you would wear in winter. As you can with most good binoculars, you can focus one barrel separately from the other to compensate for differences in your eyes. On these binoculars, the diopter adjustment is located on the right side between the eye cup and the chassis. The nice thing about this adjustment wheel is that you can lock your setting in place, since you have to click the wheel toward the eye cup before turning it. Finally, unlike most diopter wheels, which are made of plastic, this wheel is metal with fine grooves cut into it. The Vortex Razor HD 10×42 binoculars are all-weather binoculars, being one-hundred percent air and water proof. This also prevents any dust or debris from entering the system. The interior is “argon purged,” which means all the air has been removed and replaced with argon, preventing fogging. As these binoculars are moisture-free, they won’t corrode, extending their life dramatically. When light travels through a single simple lens, the distance at which each wavelength comes into perfect focus varies, causing chromatic and spherical aberrations. This results in you seeing soft images and color fringing along the edges of high-contrast images. To minimize chromatic and spherical aberrations, designers of binoculars have created compound lenses, which are a combination of several simple lenses of varying optical properties and focal lengths. The most common type of compound lens is the achromatic lens, which can bring into focus two wavelengths, usually red and blue. However, these binoculars have an apochromatic lens, which means it has three elements and, because it brings the light of three frequencies together to a common focus, it corrects chromatic and spherical aberrations better. The drawback of apochromatic lenses, though, is their weight. The Vortex Razor HD binoculars, however, balance the weight of an apochromatic lens with a magnesium chassis, making the binoculars actually lighter than many binoculars on the market. ED (extra-low density) glass is used in the design of these binoculars’ lens because it has the potential to improve image sharpness and reduce color fringing. HD (high density) glass is also used in the design of the apochromatic lens, since it is easier to manipulate and thus they are able to better focus the wavelengths to improve the color fidelity and resolution of the image even more. More than one layer of Vortex’s proprietary XR anti-reflective lens coating has been added to each lens surface that is open to the air. This greatly increases light transmittance, which results in a much brighter image. This is very important when the ambient light is not so great, as in dense woods or at dawn or dusk. Vortex has also added Armor Tech coating to the exterior lenses. This very hard coating resists scratches and repels dirt, making the lenses less likely to need cleaning and much easier to clean when they do need it. 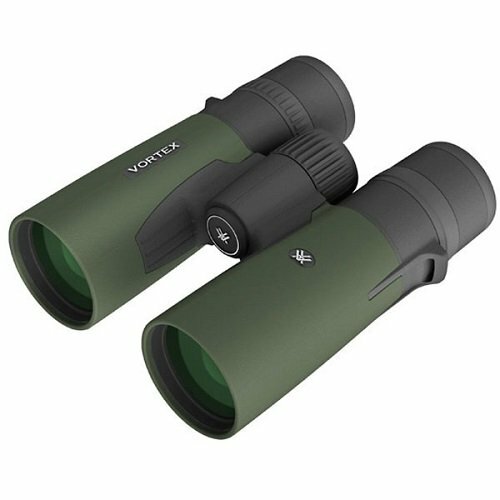 While Vortex does not say what kind of prisms they use, the best guess from the quality of other parts of the binoculars is that they are using a good quality BAK-4 glass. The first coating on the prisms is a phase correction coating. This is needed because roof prisms cause “phase shift,” which leads to a reduction in sharpness. Phase correction coating helps by preserving light in the right color phases. Thus, you get a better contrasting image with color enhancement and sharper resolution. The next coating is the dielectric multi-layer Prism Coating. What is this and why is it needed, you might ask. The downside to roof prisms is that the first prism in the system has one surface without total internal reflection, causing the loss of some light. It is very important, then, to raise the reflectiveness of this surface. To do this, Vortex has added multiple layers of Dielectric coatings. This creates a Dielectric mirror, which is able to transmit 99% of light, creating a sharper, clearer image. The width of the image you can see at 1000 yards is 362 feet or 6.9 degrees. This is certainly above average and very nice, but it’s not top-notch performance. The closest distance at which you can focus these Vortex Razor HD 10×42 binoculars is six feet, an excellent distance for full-sized binoculars. This near focus is great for observing butterflies and birds that land nearby, as well as other close objects. Compared to other binoculars of similar design, the Vortex Razor HD 10×42 binoculars have a higher level of brightness when the level of ambient light is low. Not much of a difference can be seen when the light is strong, however. This high light transmittance is very important for observing wildlife in dense woods or forests and when the sun is low on the horizon. When focused properly as you should expect, the image is very sharp. In fact, if you could zoom your naked eyes in, it would look like the image in these binoculars. The color hues are natural, not like the false hues of some inferior binoculars. On poor quality binoculars, the edges of the viewed image are often softened quite a bit. With these Vortex Razor HD 10×42 binoculars, you don’t get that image softness nearly as much. In fact, it is so minimal that you must really look to see any softening around the edges. This sharpness of image makes the binoculars an excellent device. Overall, the image is one of the best ones seen on a pair of binoculars of this type. It is crisp and clear, bright and with natural color hues, as well as being without chromatic aberrations or image softness. You’re sure to love the image seen through these binoculars! A few other things come with the Vortex Razor HD 10×42 binoculars: a Rain guard, Tethered Objective Lens Covers, a Comfort Neck Strap, and a Deluxe Padded Carry Case. The eyepiece cover, or rain guard, fits perfectly over the eyepiece, allowing for no accidental removal. It also has a flexible connector that flexes or compresses according to your interpupilary setting. The caps for the objective lenses fit well and so should not fall off accidentally. However, should they fall off, they are tethered to the barrels by a rubber loop which also keeps them out of the way when you are using the binoculars. If you don’t like them dangling down, you can also detach the objective lens covers and stow them away somewhere safe like the carry case. These binoculars come with a very comfortable padded neck strap that is also shaped to fit better around your neck and shoulders. Vortex also connected the neck strap to the nylon strap with loop connectors, allowing the neck part of the strap to remain undisturbed when you lift the binoculars to your eyes. The carrying case for these binoculars is fairly well-padded, and the binoculars fit snugly without being too tight for easy access. Accessing the binoculars in their case is easy with a quick-release buckle and strap. There is also a mesh pocket on the inside of the lid for storing a few personal possessions such as an ID, a hunting license, and/or a lens cleaning cloth. There is a separate unpadded neck strap that comes with the carrying case, but it can be attached or removed. If removed, the padded neck strap of the binoculars can be threaded through to be used instead. You can also carry the binoculars on your belt via a few loops on the back of the case. While not as luxurious as some binocular cases, this carrying case does the job and has easy access to the binoculars. The overall performance of these binoculars is exceptional. They have a crisp and clear image, are easy to focus and adjust, and have some extra details that add up to greatness, such as the neck strap’s comfortability and the tripod or car window mount possibility.